Rescuers found the pilot of one of the two Su-34 fighters that had collided in midair in the Far East on January 18. "The pilot was found on the life raft in the course of the rescue operation. He was lifted to the Mi-8 rescue helicopter safely," officials with the Russian Defence Ministry said. The rescue operation takes place in severe weather conditions with squally winds and storm of force 4, officials added. 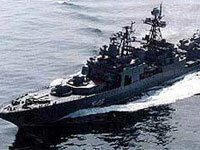 Six ships and a Tu-142 anti-submarine aircraft were sent to the area of search. Two Su-34 aircraft touched wings and crashed into the sea during a scheduled flight. The pilots of the bombers ejected. It was later specified that one fighter jet crashed into the sea, while the fate of the other one remains unknown. Most likely, the pilots miscalculate the safe distance between the aircraft. Su-34 flights throughout Russia have been suspended. The incident occurred during a scheduled training flight over the Sea of Japan, 35 km from the coast, during manoeuvring exercises. The two aircraft were on a mission without ammunition, Defence Ministry officials said. Update: The pilot of the second aircraft has also been recovered from water. He remains in satisfactory condition.